What to look for when buying a used Honda Civic? The Civic is one of the longest-running cars in the Honda lineup of vehicles and is one of the company's best-selling vehicles. A leader in the subcompact segment, the Civic entered the market in 1972 and has gone through ten generations since, with the tenth generation introduced for the 2016 model year. The Civic has earned a reputation for quality, dependability, and sportiness. It is not unusual to see a Honda Civic that is ten or more years old retaining good market value despite age and high mileage. Currently, the used market is reflected in iSeeCars listings with tens of thousands of used Civic cars being available around the country. Most of these used Honda Civic cars are of the 7th, 8th, and 9th generations (2001-2015 model years) in both coupe and sedan models. When looking at a used Civic inside these years, check for the usual items that should be inspected in a used car. The older it is, the more the chassis and body should be checked for wear and damage. With most Honda Civic models, however, the best indication of a car that will continue to be a reliable, fun-to-drive vehicle is in maintenance records and history. A well-maintained Civic will provide many years of excellent service. Buyers should also be aware that it's not unusual for a used Honda Civic to have been modified in the aftermarket to enhance bodywork and improve street racing performance. This could adversely affect fuel economy in the Civic, but may improve appearance or resale value. A quality, used Honda Civic can be found relatively easily given the robust nature of the car and its popularity as a new vehicle purchase. What is the average price for Used Honda Civic? How many are for sale and priced below market? What Honda Civic model year and mileage can you get for your budget? Where does used Honda Civic rank in comparison to competitor vehicles? What Is The Average Price Of A Used Honda Civic By Model Year? What Is The Average Price Of Competitor Cars To The Used Honda Civic? What Is The Average Price Of Used Honda Civic In The Top 10 Cities? The Tina Turner song "The Best" could quite easily be the theme song for the 2016 Honda Civic which, with its ever expanding lineup of models and bodystyles, managed to swoop into one of the most fiercely competitive market segment and stood clearly head and shoulders above them all. It's really that simple. We tested a Touring sedan with the all new 1.5 liter turbocharged 174-horsepower engine and it felt underpriced at $26,000 and change. And that's for the loaded model. In addition, Honda recently introduced a coupe model and after that comes performance Si, Type-R and all-new hatchback versions of the iconic nameplate. Affordable performance enthusiasts will welcome the newfound availability of a six-speed manual transmission option on all trim levels of the hatchback with the punchy, rorty and rev-happy 1.5-liter turbo motor we so loved in this test albeit with an admittedly well tuned CVT-automatic. The 2016 Honda Civic is well priced too with base models starting just over $18,000 nicely equipped and featuring a 2.0-liter non-turbo 4-cylinder offering 158 horsepower/138 lb. feet of torque with a six-speed manual available only on base LX sedans. Still, we can think of few better ways to part with $18,000. And did we mention how stylish this new Civic is? Bold, dynamic and stylish are the words that came to mind when gazing upon our new Civic tester. Read on to see if you agree. Although Honda managed to silence most critics of the 2012 redesign of its compact stalwart Civic with a shockingly thorough refresh in 2013, apparently the brand still wasn't satisfied and has made yet still more major changes to the car for 2014. Honda has always been known for having shorter model cycles than other automakers but seriously this is getting ridiculous. Clearly Honda's engineers and manufacturing powers that be can react at the speed of light but what do we think of this updated 2014 model? First off, let's go over what they did to enhance the 2013 Civic. Honda started by boosting interior materials quality to class leading levels with a sense of perceived quality that is undeniable. Then they continued by enhancing steering feel with changes to where they mounted the rack, interior noise dropped noticeably thanks to sound deadening measures and suspension adjustments made the ride smooth yet still as agile as any Civic owner should rightly expect from this always fun to drive car. You'd think that was enough right? Wrong. So, for 2014 Honda replaced its five-speed automatic which to our thinking worked perfectly well and replaced it with a new, more efficient CVT automatic similar to but not exactly like the one found in the larger Accord. Then, to quell complaints that its navigation system was antiquated and the stereo face plates which we thought were delightfully straightforward have been replaced by new, state of the art high-resolution 7-inch touch screens on all models even those without navigation. With this new feature also comes a back-up camera and features like the Honda-Link system previously only available on Accord. People also didn't like the fact that last year's model used a key to start it, apparently, so Honda responded by adding a Stop/Start button on the dash. And lastly, on the safety front the Civic also now boasts Honda's Lane Watch System which has a camera in the passenger side mirror so every time you activate your turn signal you can see across the two lanes next two you via the center screen to ensure no one is in your blind spot. Happy now? The 2014 Honda Civic is available as either a slightly remodeled coupe or a stylish four door sedan and can come equipped with a range of powerplants spanning everything from a hybrid gas/electric, a 1.8 liter 143 horsepower/129 lb. feet of torque 4-cylinder, the Si model's 2.4 liter 201 horsepower/170 lb. feet of torque 4-cylinder on down to even a natural gas powered variant. 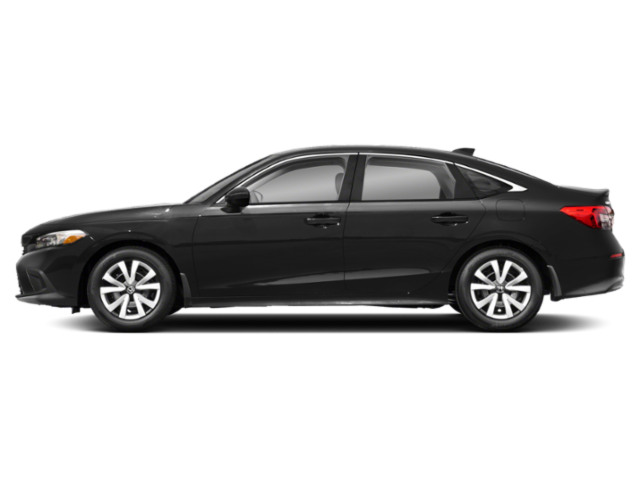 Prices range from about $18,000 for base LX models all the way to $27,335 for a fully loaded 2014 Honda Civic Hybrid sedan with leather and navigation. And trust us, there are Civic's at every price point in between. 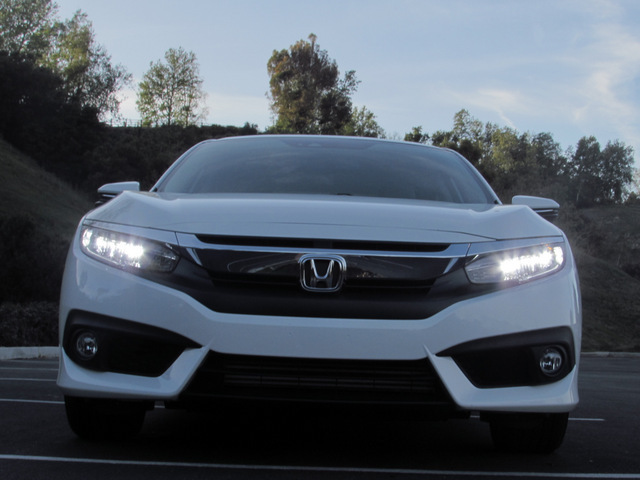 Our test model was a 2014 Honda Civic EX-L coupe equipped with the new CVT automatic transmission but we have tested a 2013 Honda Civic Si, 2013 Honda Civic EX sedan, the hybrid as well as the Natural Gas model so our experience with this model is very broad. We will in this review, however, be focusing mainly on the volume selling 2014 sedan and coupe with the 1.8 liter 4-cylinder and new CVT automatic. If you have any questions about any Civic model, feel free to contact us with questions via the email address team@iseecars.com or send me a direct message on Twitter @jameshamelcaroc. I will respond to all queries. The 2013 Honda Civic is a compact five passenger car offered in coupe and sedan body styles, available in gasoline, natural gas and hybrid versions. Although the Civic was completely redesigned for the 2012 model year, the changes were not very well accepted, leading to a significant refresh for 2013. These included the addition of more standard equipment, new body structure, new front and rear styling, and softer-touch interior materials.